Johanna's Spillworthy Thoughts: I won. I won. I won. I played a word game at Dina's Lair of Doom and I won. She said I won a signed copy of The Eternal Kiss. And I did. She signed her short story entitled "All Wounds." If you're not following Dina, you might not know that she expanded that story into a novel, All Wounds. Yep. She made it long enough for italics. We'll all be able to buy it this October from Mundania Press. But seriously: check out the rest of those pictures! 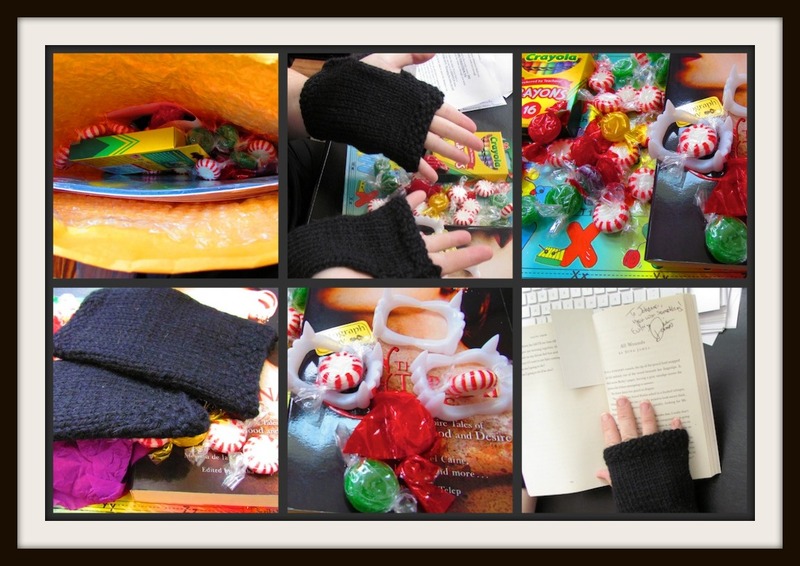 She sent yummy, hand-knit, fingerless gloves. And candy! And crayons and a word search and a coloring mat---and VAMPIRE FANGS! This woman knows how to do a giveaway. So I'm dancing and oh-so-happy. You can send me eviltry any time, Dina James. No wonder you have so many happy minions. So glad you liked everything and the handwraps fit! I have a story about those. I'll mail you about it later! Glad everything made it intact! Have fun! late, as usual, here. If I wasn't late you wouldn't know it was me. Congrats on the Big book & stuff win.